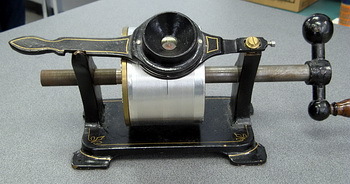 This exact replica Edison Parlor tinfoil phonograph was one of 25 commissioned by Ray Phillips, who has the original from which the parts were cast. This machine works remarkably well and I have successfully used it for demonstrations many times. The original version of the Parlor model was manufactured by Sigmund Bergmann in early 1879 and sold for a price of $15. In late 1879 the second version (this one) was manufactured by the Brehmer Brothers and sold for $10. 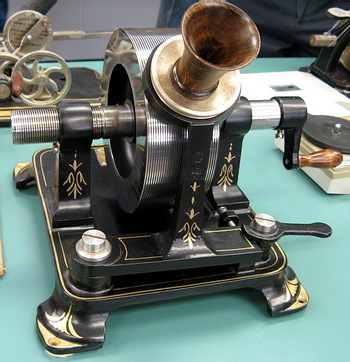 Even with the price reduction, few Parlor Phonographs were sold and as a result they are extremely rare. The Brehmer Brothers version has a raised collar on the left side of the mandrel so that, if the tinfoil were removed, it could be repositioned on the mandrel to replay the recording later. In practice this never works very well. 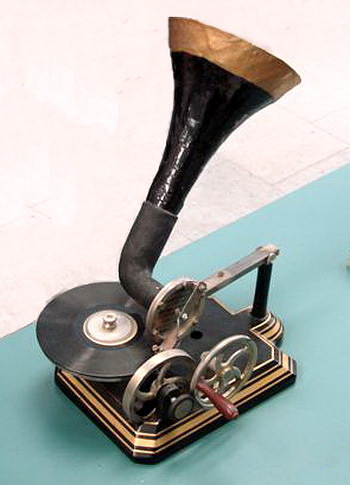 This exact replica Edme Hardy tinfoil phonograph was another machine commissioned by Ray Phillips, who has the original from which the parts were cast. This machine also works well and is a faithful replica. In February, 1878, Edison shipped this new model to his representative in France as a sample to be reproduced there. Parisian machinist Edme Hardy was contracted to manufacture this version and it is estimated that 500 of these were produced for sale at $40 US each. This machine is superior in design to the Parlor phonograph in that finer adjustments can be made to the depth of projection of the needle into the tinfoil and in the alignment of the tinfoil. Surprisingly, however, I have had better success demonstrating the Parlor phonograph. Gillett tinfoil phonographs were never commercially produced, as all are built from a set of plans from a book titled The Phonograph and How to Construct It, by W. Gillett in 1892. For many years builders have used these plans to construct this well-designed machine. This version was built by Paul Gildea from Sandy Hook, Connecticut and I have found that it works as well as any of the tinfoils I have. Originally when I received it, the feed screw had a slight bend and I was very pleased with how Paul took it back and fixed it free. Over the years, a number of these machines have shown up on e-Bay and they tend to sell for a very reasonable price. Yet another replica machine commissioned by Ray Phillips. This small machine is again a faithful reproduction of a rare piece from the dawn of sound reproduction. Having compared this to an original, I am satisfied that it plays and sounds as well as the original, which is not to say much. When Emile Berliner developed his design for the disc talking machine in the late 1880s, he contracted the firm of Kammer & Reinhardt in Germany to manufacture this toy which was distributed in Europe and Britain in the early 1890s. The 5-inch records manufactured for this machine are as exceedingly rare as the machine.